This Week is Our Garden Sale! Colby Cottage welcomes you to our Spring Garden Sale! This week is the week, weather permitting, we will be opening up the outdoor garden yard and filling it with statuary, birdhouses, arbors, and various other garden decor and flowers. The sale starts Friday, April 16th at 10:00 am. We will be serving treats and lemonade and you may also be welcome to order tea or coffee drinks! Please join us and hope for lots of sunshine! That's right, we even have blueberries! Feel free to stay a while and have a cup of tea! I am married to Marv and proud parent of 8 great kids. Some are grown and out of the house and some are still at home. We live a simple life,our children, our friends and our faith are the most important things to us. We combine work with family life as we run a home business. We have an Antique and home decor business that is our full time work. 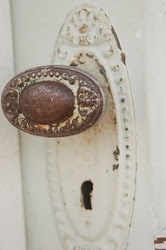 We also enjoy finding wonderful old items to decorate our home and yard. Making my way back to the studio! From The Heart - 2012 BH Lineup!